Here’s a great software which allows you to create ringtones for your iPhone with ease. You can choose any of your favorite MP3s to convert and use them as your iPhone ringtone. Once you create your ringtone, you can easily transfer them to your iTunes or iPhone. Using this software you can convert three types of files- WAV, OGG, MP3 into iPhone ringtones. Apart from just converting music into ringtones, you can also add some awesome effects like fade in and fade out to the song. So this software is something more than just an iPhone ringtone creator, it’s an iPhone ringtone editor, iPhone ringtone convertor, iphone ringtone editor, an all in one solution. To create a ringtone from your favorite mp3 all you need to do is just right click on it and select “Create a ringtone” and voila! Within 30secs your ringtone is ready. Once done, you can upload it to your iPhone by clicking on “Send Ringtone to iPhone”. 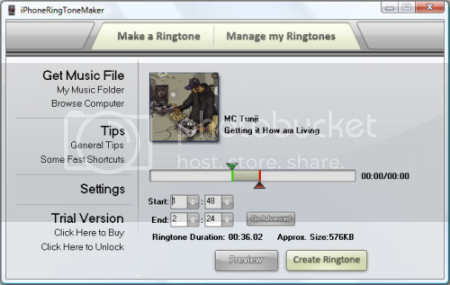 The iPhone Ringtone Maker is a shareware and hence can be used for a trial period of 5 days. If you like it you can get a full license for around $15. It’s available for both Windows and Mac users.